The president of Libya's Olympic committee, Nabil Elalem, is reported to have been abducted in Tripoli. According to eyewitness accounts, Mr Elalem was in his car with a colleague when two vehicles carrying armed men forced him to stop in the capital. A spokesman for Libya's Olympics commission told a Libyan TV channel that the men had claimed to be from the army and asked Mr Elalem "politely" to go with them. His colleague was left in the car. Mr Elalem's whereabouts remain unknown, and there has been no information yet about the identity of the alleged kidnappers. 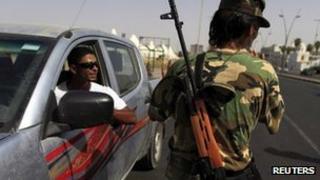 However, Libya's Olympics spokesman later said that the attackers were not members of the armed forces. He added that Mr Elalem was taken away by the men when he was putting his laptop in the back of his car. Libya's Sports and Youth Minister Fethi Tarbel told Reuters news agency: "We condemn this kind of action. Whoever did this are criminals. "This goes against the revolution, this brings us back to the Gaddafi culture... I don't know if he [Mr Elalem] had any issues with anyone." The President of the International Olympic Committee, Jacques Rogge, expressed "grave concern" over the incident, adding that his organisation "offered any possible help we can give". Before the fall of Muammar Gaddafi in 2011, the Libyan Olympic committee was headed by his son Mohammed, who has since sought refuge in Algeria. Libya's current interim government has struggled to bring armed groups under control. Some former rebel fighters have refused to lay down their arms and often take the law into their own hands, detaining people and running makeshift jails in some parts of the country. Earlier this month, two Libyan journalists were kidnapped near the former Gaddafi stronghold of Bani Walid. And a militia in the town of Zintan is still holding Saif al-Islam Gaddafi, the ousted leader's son, who is wanted by the International Criminal Court.